Aquatic turtle water needs to be warm, clean and fresh. It also must be deep and wide enough to accommodate your turtle's adult size, which is usually significantly larger than when you first get him. You'll need the proper aquarium equipment to keep the water clean and warm, frequent water changes, and the right dechlorination method. The only legal aquatic turtle pets are freshwater turtles. These require normal freshwater, which you can get straight from your sink's faucet. You'll have to remove chlorine and chloramine -- chemicals added to city water supplies to kill bacteria, which can also harm your turtle. You can get water conditioner drops at almost all pet shops. These neutralize chlorine and chloramine instantly. Buy one that doesn't have a "slime coat" -- those are for fish and amphibians. The usual dosage is one drop per gallon, added before you put your turtle into the water. Use the conditioner every time you change the water. Turtles eat a lot, and they poop just as much. You must change at least half of your turtle's water and siphon out the poop every single day with no filter, or twice a week with a filter. You'll also need to do a full water change and tank scrub at least once a week with no filter, or once a month with a filter. 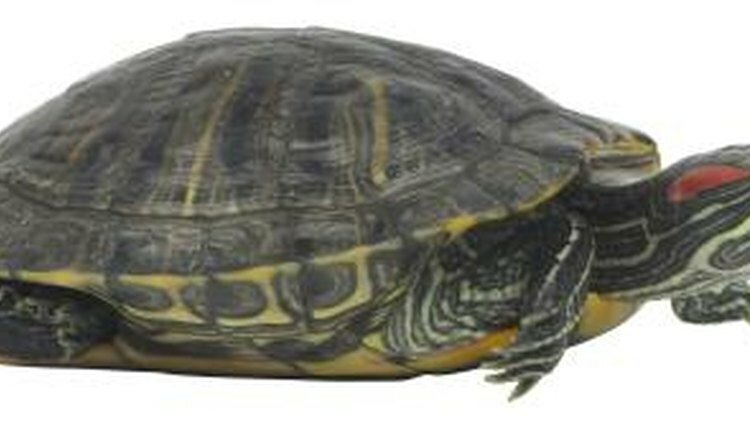 Turtles can use under-gravel, canister or sponge filters. Each has some drawbacks -- under-gravel filters may get clogged or dug up; turtles can knock canister filters free or, when very small, get trapped in the current, and they may tear up sponge filters. It can take some experimentation to find a filter that works with your particular pet. Red-eared slider water temperatures should never drop below 75 degrees Fahrenheit or climb above 85. The lower range is for nighttime, the higher range for daytime. It's best to have a gradient in your tank. Always use thermometers to monitor the temperatures at each end and on land. The dry basking area should be between 85 and 88 degrees Fahrenheit during the day. Different species have their own unique temperature ranges. A turtle who's too cold will starve to death or die of infection; one who's too hot will die of hyperthermia within hours. You can use protected underwater heaters, protected reptile heat lamps, or under-tank heaters. Turtles don't just need water, they also need substrate to keep the water clean and disease-free, and a basking area where they can completely dry out, rest and warm up. Use several inches of gravel substrate that's either too small to choke on or too large to fit in the turtle's mouth. Use well-anchored aquarium wood, such as "African root," smooth, stable stones, or Plexiglas ramps and planks. Make sure your turtle can actually get out of the water at all times without being able to climb out of the tank.